Integrity, curiosity and a constructive attitude. Find out what Francis Pun (BASc ’94) has to say about work-life balance and why it doesn’t exist for him. Engineering has opened up many paths for Francis, from Prince George, Tokyo and now Hong Kong at TE Connectivity as the Data Analytics Lead for the Communication Solutions division. Currently, I lead our data analytics program for a US$1B global business operating in the communication electronics industry. From manufacturing to distribution, we generate enormous amount of data in managing our business. So we are developing better ways to derive insights out of the data to our end users so they can better serve our customers. Previous to that, I managed an innovation program for our 1400 IT colleagues around the world, where we are globally collaborating on ideas for development. My background is in program management and business development in the digital arena with US multinational tech/industrial companies. I’ve been very fortunate to have worked in different geographies starting from Prince George to Hong Kong with stops in Tokyo and Singapore in between. Leaving the nest in Vancouver to start a lone-person service engineer job based from Prince George was the first milestone. For 2 years, I put on 180,000km in a Ford Taurus station wagon doing mainly grave-yard shifts servicing lumber mills and pulp & paper mills throughout BC, northern Alberta and Saskatchewan. Then I did a 180 and ventured to Hong Kong as I applied for business school. There, I did various sales and project engineering work, then 2 years later, I was back in school in Canada in London, Ontario. Business school set me on today’s trajectory, when I found work at Dell Japan during an exchange program to Tokyo in my last semester. Just my luck, I entered the technology/digital industry when the dot-com’s busted. Fortunately, I was able to make it work and 2 years later, I relocated to Singapore to do the same in an Asia Pacific capacity. For family reasons, I moved to Hong Kong again and was able to find work with Cisco Systems. Then in 2010, my current firm was looking for a global lead to start out their digital marketing operations, where with the combined tenure at Dell and Cisco, I was able to fit the bill. Work-life balance has disappeared and it’s all about work-life integration. Meetings and conference calls are intertwined with picking up the kids, dinner and friends & family time. Reporting to headquarters in the US with it being 12 time zones away is part of the reason. The working hours hasn’t necessarily increased but it’s the accessibility of a colleague halfway around the world through your smartphone that requires you to be always ON. Given those conditions, it’s key to enjoy what I’m doing; something with purpose that have opportunities for growth. Treasuring the simple with a wonderful family that’s developing well is the top highlight. My wife has her own aspiring career and the kids are growing up with amazing exposure in a healthy and balanced way. With that, from living in different places, the other highlight is befriending generous people along the way – from the firefighter family that I roomed with while in Prince George to my homestay family in Fukuoka, Japan to my UBC alumni roommate in Singapore, while still able to keep my extended family of friends in Vancouver. With the diversity of backgrounds that I’ve encountered, be it social-economic or cultural, once I got passed the initial impressions, I found people to be largely similar and good-natured. I should thank the Canadian upbringing that gave me a head start to appreciate this. I’m fascinated with the evolution of human civilization and how societies have developed throughout history. There are social root causes that set things in motion a long time before incidents hit the news. So perhaps I would choose to be a social-economist to help develop meaningful change through analysis of social-economical issues. I am a big fan of Professor Francis Fukuyama of Stanford University and his work on this topic. His ability to connect the dots across multiple disciplines in an encapsulating narrative that a layperson like me can understand, is uncanny. Check out his YouTube videos. I was just an average student. In fact, I probably wouldn’t have gotten in today after hearing about the high entrance requirements that are needed today. Part of this is that I had a mental block with computer programming. I just didn’t think I could do it and I was very impatient in having to be precise with syntax. So I dreaded the one computer science course that we had to take, which was on FORTRAN 86. But I took it on as a personal challenge, spent extra efforts and in the end was able to get one of the top marks in the class. Interestingly enough, 10 years later at Dell, the logical and systematic thinking coming from this course helped me to work alongside software developers to deliver our web projects, which then set me on the career path to today. So you never know when or where hard work pays off. I’d like to add that from my business school experience, I am a huge proponent of the case study method or Socratic learning. This is where the student studies in advance, comes to class prepared to discuss real-life cases with expert facilitation. It brings an elevated level of relevance, connectedness and participation that sums up to efficient real-life accelerated learning. In business school, for example, we discussed engineering related cases in operations and process design which can easily be catered to a more technical audience. The first and most important is to have a solid sense of integrity. The second is to have a constructive attitude, which, along with the first, will carry you especially through challenging times. The third is to stay curious where being a good listener and having a sense of humility make it effective. I’d enjoyed getting involved in Intramurals and participating in social activities. By my final year, I lead a team of organizers to organize a series of sporting events for one of the largest social clubs on campus. Activities ranged from regular gym nights to Whistler ski trips. Our Div 3 basketball team, which comprised of mainly Mechanical engineers, won our division championship as well. Something that I can definitely improve on is the ability to think and converse succinctly in analogue in real-time. During my time, much of the education process was quiet independent book learning where problem solving was either correct or incorrect, 1 or 0s. While that’s fundamentally and technically critical, problem solving at work involves much debate with insufficient and conflicting information. This is even more challenging when you are working across the Americas, Europe and Asia Pacific. b) Participate in more than the academics, get involved – whether it’s engineering competitions or community leadership, etc., these areas of participation will help you develop life-long skills to be valued members of any team. c) Get to know your classmates, especially those of different cultural backgrounds – I don’t know how this is nurtured today, but during my time, this was an under-tapped resource. Activities can be simple lunches amongst new friends to a diversified study/project groups to organizing a multicultural student club where people can share their backgrounds with others. As geo, knowledge and communication boundaries draw closer, the bonds of trust that you build with these activities become a rich network that you can tap into throughout your career beyond Vancouver or even Canada. 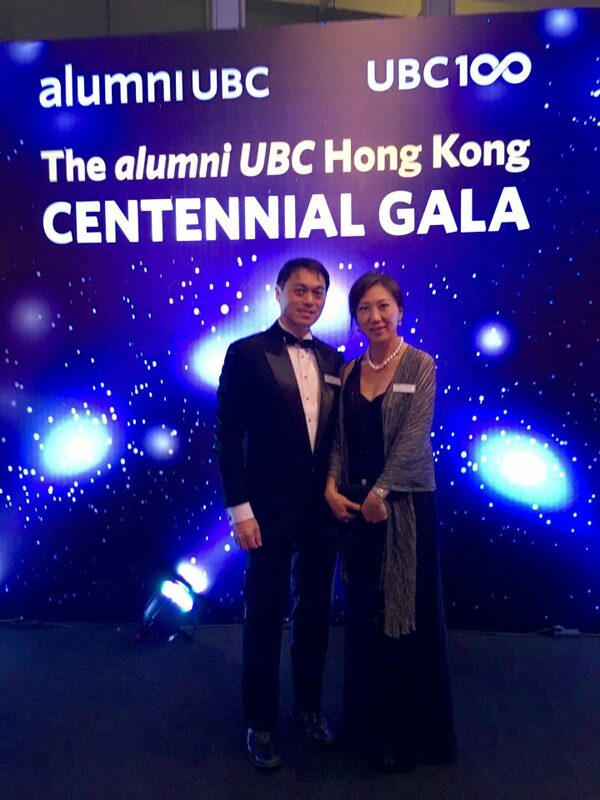 Case in point – With the largest UBC Alumni community outside of Canada in Hong Kong, just before Christmas 2015, we celebrated the UBC100 Centennial by having a gala banquet of 300+ alumni and friends at the Four Seasons which is one of the top hotel venues in Asia Pacific. This was organized by the UBC Alumni Development and Engagement office with a handful of HK volunteers forming the Leadership Advisory Council, in which I represented Applied Science. With our regular jobs and family commitments, there wasn’t much time. This meant we had to be decisive, trusting and efficient. We were able to do this because we’ve worked with each other before, some of us going back to our UBC days. As it turned out, we sold out tickets a month in advance. UBC Opera came to enamor us with their talents, Lorraine Hahn, UBC alumnus and world renown business journalist was the MC for the night, and it turned out to be a magical celebration that can rival any top university in the world. All the best. Tuum Est – it really is Yours!